Has the time come to teach your child mathematics? Looking to combine fun and learning? A toy cash register might be what you’re looking for. 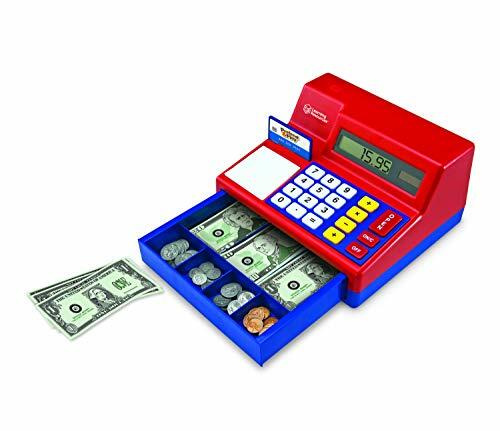 Let’s have a look at the factors to consider before purchasing a toy cash register. I’ll then share my selection of the best out there. Use the links above to check the latest prices or read our in-depth toy cash register reviews below. Whether you’re shopping for a toddler or older child, here are a few tips to make this process easier. As with most kids’ toys, age should be the first consideration. Cash registers often include small pieces, becoming a potential choking hazard. Other machines combine advanced technologies and detailed accessories that the youngest won’t necessarily understand nor use. Toddlers imitate what they see and experience in their everyday life. When you’re shopping, they might want to handle the payment process. At home, role play is important for their development, enhancing problem-solving, imagination, and social skills (source). Cash registers aimed at toddlers are normally placed on the floor or on a table. Older kids, however, might enjoy freestanding cash registers. Although most freestanding styles can be safely used by toddlers, they’re normally best for older kids. They’re not only extremely realistic, they also come with all the technology, mimicking a real grocery store. 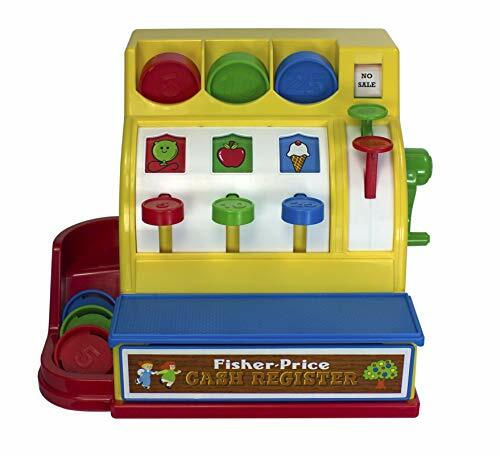 Toy cash registers are often made of plastic or wood. Both materials have their advantages. Toddlers may need sturdier machines with larger pieces and accessories. Wooden cash registers could be ideal as they’re often more durable and come with thicker bills and coins. Most wooden machines, however, aren’t as interactive as plastic toys. They’re also heavier, and toddlers might need their parents’ supervision during playtime. Cash registers made out of plastic can be more interactive, with audio phrases, sounds, and lights often included. Plastic machines are also lighter weight. They’re usually more affordable than wooden toys for this reason. On the downside, plastic machines aren’t as durable and might not last as long. Plastic can also contain Bisphenol A (BPA) and phthalates, which are considered toxic and potentially unsafe for children (source). 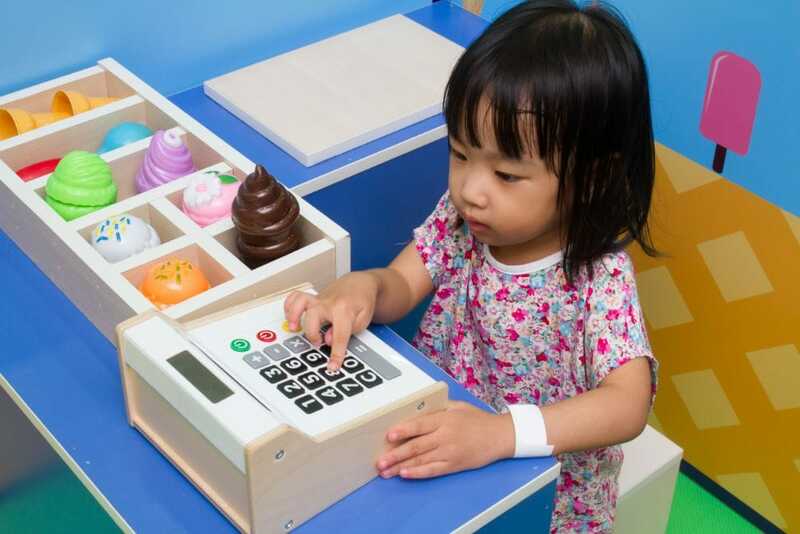 Selecting a BPA-free toy cash register for your child helps ensure their safety while playing. 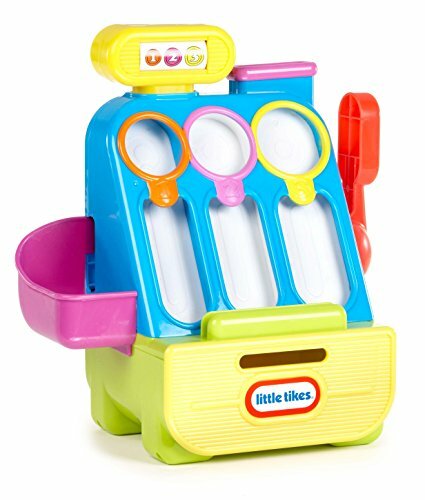 Most toy cash registers come with coins, bills, and a drawer, encouraging role play and introducing your child to currency and numbers. To make the experience more realistic, they often have additional accessories. Pretend credit cards, scales, and scanners might inspire creative storylines. Working calculators can teach your child to subtract and add. Some cash registers even come with food items and storage shelves, recreating the atmosphere of a real store at home. It might be a good time to teach your child the value of money. Indeed, toy cash registers can be a great learning tool. 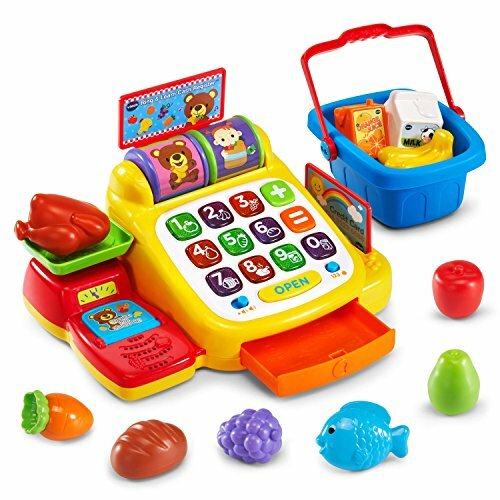 Among all the options available online and instore, which are the best toy cash registers for kids? Let me share my favorites. This might be the most comprehensive toy cash register. Suited to children 3 years old and up, it will definitely grow with your child as they develop. 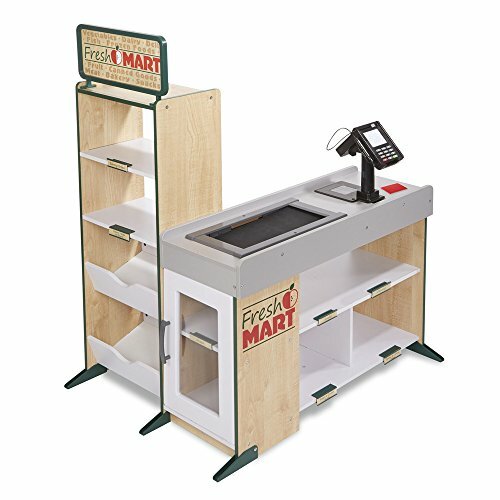 This cash register includes a counter, a fridge/freezer, shelves, and a shop storage space for a complete experience. When passing the items through, the scanner lights up and beeps. A manual conveyor belt, credit card reader, and calculator should keep your kid engaged for some time. The Melissa & Doug line also sells a food companion kit, shopping cart and more, for when you’re ready to add on. This seems to be one of the best-loved cash registers. There are two color schemes to choose from — red/blue and pink — making it suitable for either boys or girls. 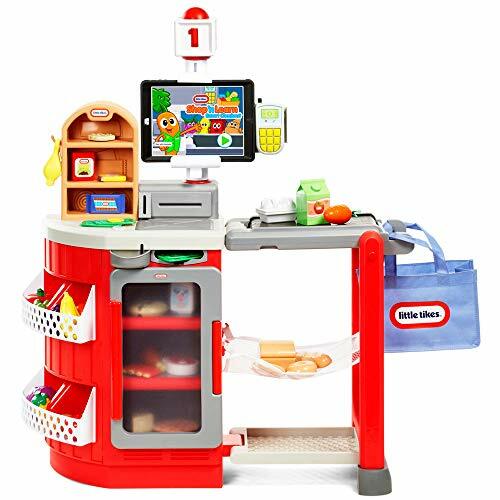 The large buttons and cash drawer are designed for small hands, 3 years old and up. It comes with 73 plastic American coins and bills, a solar-powered calculator, and a pretend credit card swiper. For realistic roleplay, the machine makes that typical “cha-ching” sound when the cash drawer opens. A vintage concept with a modern and stylish design, this toy cash register is user-friendly and conceived to suit 2-year-olds and up. It also comes with two pretend credit cards and a reader, to allow a different method of payment. Most children shouldn’t have any issue pulling down the large and easy to grab side handle, allowing the drawer to open. The large coins, coming in three different sizes and colors, make this toy educational for the youngest of users. 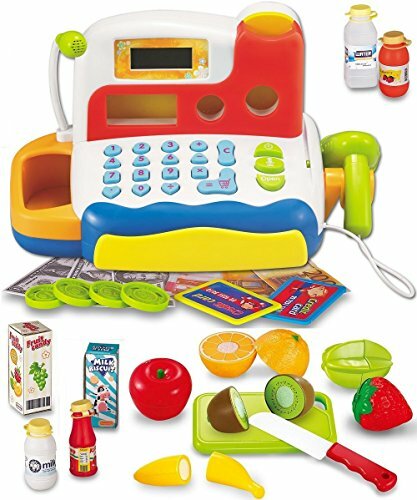 This toy cash register will “wow” most kids 3 years old and up. For parents, this machine offers great value in terms of functionality, accessories, and price point. It’s also made of durable plastic material to withstand drops and throws. Although it’s designed for younger kids, it still features educational and entertaining accessories. In addition to the coins and bills, it includes a built-in microphone and a scanner that emits lights and sounds. To make the experience more realistic, pretend food and drink items are included. We couldn’t leave out the new walkers and talkers — this machine is designed for toddlers starting at 12 months old. Taking both credit cards and cash, it features big numbered buttons that light up when pressed, a scale, and a cash drawer. The included food items and basket make the roleplay more realistic. Furthermore, over 80 songs and phrases are included to keep your toddler entertained and excited. Some of those phrases feature healthy eating info as well. This retro cash register has a unique design aimed at children over 2 years old. It comes with six colorful coins to teach your little one numbers and colors. Coming in five, 10, and 25 increments, the numbers on the coins match the numbers on the levers, helping with recognition and matching. Just like old times, when the side handle is pressed, coins roll down, and the drawer opens with a ringing sound. This freestanding grocery store shows a modern and colorful design, mimicking a real checkout stand and more. 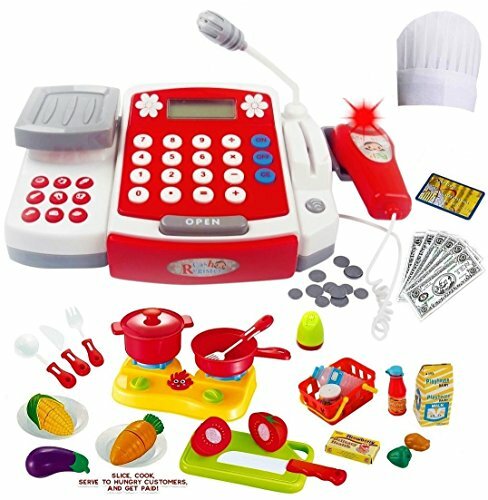 For kids aged 2 years and up, this comes with over 35 accessories and a real checkout screen. All food items included are scannable, just plop them on the electronic conveyor belt and check out. An interactive application can be downloaded on Android and iOS phones, connecting to the screen through Bluetooth connection. The application gives access to five fun learning games. Last but not least, the bagging area folds to save space. This well-designed toy cash register is made of wood. It should entertain any child over 3 years old — and potentially be passed to a younger sibling down the line, thanks to its durability. An easily accessible push handle opens the cash drawer and three different coins can be placed in the machine. Alternatively, if your child’s customer doesn’t have cash, a credit card can be swiped. Sometimes, learning might need a little extra motivation. 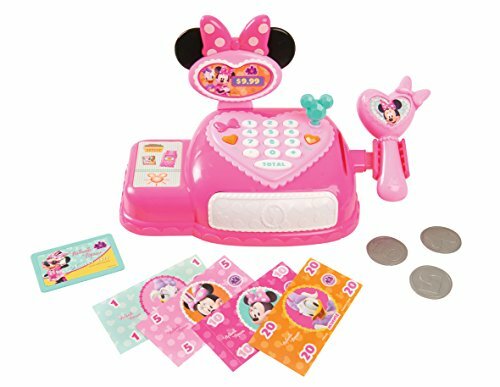 This Minnie Mouse cash register should be enough to get your little one counting and learning in no time. This machine is safe to use for those aged 3 years and up. Each accessory is Minnie branded, including a heart-shaped dialing pad, screen, scanner, credit cards, and coins. You won’t find boring American bills in this game, each bill comes with a character’s face from Minnie’s clique. No stone’s left unturned in this themed option. This unique set allows for several different activities. Geared towards children 3 years and up, we’d imagine this one will stay with you well into primary school. The shopping activity includes a cash register with a real microphone, scanner, bills, coins, and a scale. A basket tops it off, because no one likes to walk through the store with full arms. After the shopping is over, your little one can go into full chef mode. The set includes a mini stove, cutlery, pots and pans, sliceable veggies, and even a chef’s hat. 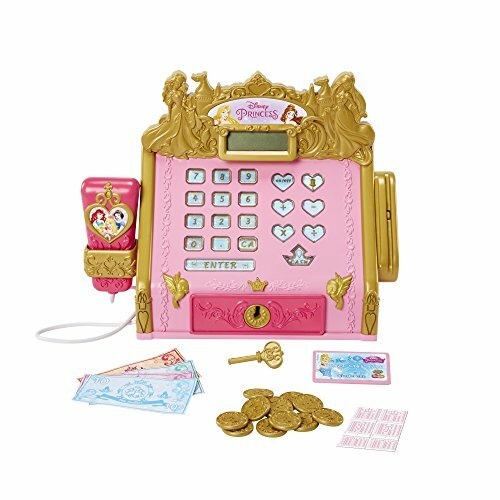 Little princesses might want princess toys, and everything about this cash register is princess-friendly. For a 3-year-old and up — get ready for a magical time with this one. Decked out in pink and gold, there’s no option but to go all-girl. This extraordinary set comes with a real calculator, six heart-shaped buttons, 12 coins, and a princess credit card. An old fashioned key opens the cash drawer and a royal scanner will beep when an item is scanned. As parents, we’re usually on the lookout for smart alternatives. Especially when it comes to teaching our kids subjects that are considered boring to most — such as mathematics. 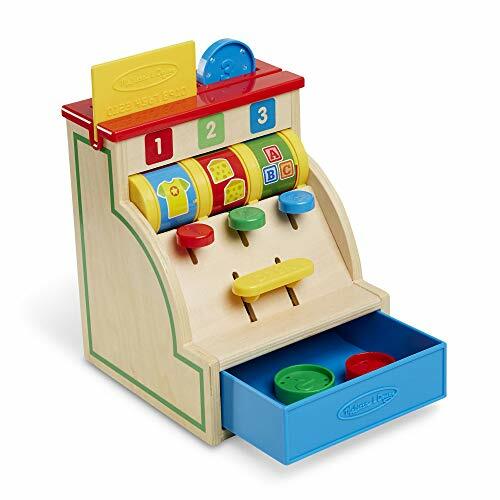 Toy cash registers can be great helpers, accompanying your child in their development. While we had a hard time choosing our favorite, we had to go with the Melissa & Doug Freestanding Grocery Store. Not only is this brand known for its durability, with all the activity options and space for multiple children to play, we think it will stay popular for a while. Which toy cash register did you purchase? What features were you looking for? Please leave a comment in the section below, we’d love to hear from you.